A Sailor assigned to Explosive Ordnance Disposal Mobile Unit (EODMU) 3 based in Coronado, California, died Oct. 20 after sustaining injuries while deployed to Iraq. Chief Petty Officer Jason C. Finan, 34, of Anaheim, California, was serving in an advisory capacity to the Iraqi coalition force supporting Operation Inherent Resolve in Iraq. 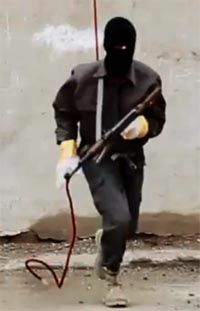 Finan was killed when an improvised explosive device exploded...Developing an EOD capability has been important due to the Islamic State planting roadside bombs and booby-traps as they have moved throughout the region. Issue 15 of ISIS' Dabiq Magazine: "Break the Cross"
ISIS has released Issue 15 of Dabiq Magazine, titled "Break the Cross." You can read a safe copy of the 82 page magazine here or here. I immediately turned to the end to see if there was something written by hostage John Cantlie. There is not. There are some new themes, such as the West is damned if it does and damned if it doesn't. Even if the bombings stop, it says the best the West can hope for is a temporary truce. See page 30: "Why We Hate You & Why We Fight You." Shorter version: Because you are non-believers. The invasions and bombings are secondary. 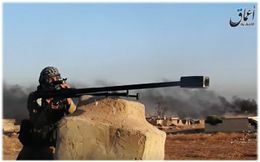 ISIS Releases Nasheed Video "Blood for Blood"
ISIS news of note this week: Al-Hayat Media, ISIS' official media arm, has released a new "nasheed" video featuring child fighters. It's called "Sang Pour Sang" (Blood for Blood). The children sing in French, but there's an English and French option for viewing the words. The point of the video: to warn the U.S. and its allies that revenge for the airstrikes is coming. Time Magazine reports on the slow but steady increase of U.S. troop presence in Iraq. Apparently, it's in preparation for the upcoming battle to retake Mosul from ISIS. Unless you have a loved one in the U.S. military, you probably haven’t been aware of the slow-but-steady increase in American troops on the ground inside Iraq.... On Monday, Pentagon officials said the total U.S. troop presence in Iraq would grow by more than 200 troops—to a deployed force of 4,087—as Baghdad and Washington prepare to take Mosul back from ISIS. Troops on temporary assignment in Iraq, those guarding diplomatic outposts—or those rotating in to replace troops who haven’t left yet—aren’t included under that 4,087 ceiling. When they are, Pentagon officials say, the total U.S. troops presence in Iraq is creeping toward 5,000. Multiple news sources are reporting that ISIS militant Ali Saqr al Qasem, on orders from ISIS, publicly shot and killed his mother outside the post office where she worked in Raqqa. The reason: Al-Qasem had reported his mother for apostasy -- she had encouraged him to leave Raqqa with her. ISIS then ordered him to kill her. True? I'm dubious, but I suppose it's possible. The source is the Syrian Observatory of Human Rights. Ramadi and the "Scars of War"
The New York Times has a thoroughly depressing article on what remains of Ramadi now that the Iraqi army has dislodged ISIS. Few civilians remain from a population that once numbered around 400,000, and the city lacks electricity and running water, meaning that supplies must be trucked in...It remains deserted, except for a contingent of Iraqi troops who do not wander around much because Islamic State fighters still hit it with mortar rounds. Update: Thanks to Pieter Van Ostaeyen for publishing the English translation of ISIS leader al Baghdadi's speech. "With the help of Allah, We are getting closer to you every day," al-Baghdadi told his Israeli listeners. "The Israelis will soon see us in Palestine. This is no longer a war of the crusaders against us. The entire world is fighting us right now." 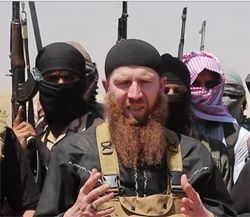 The ISIS leader continued, "The Israelis thought that we forgot Palestine and that they had distracted us from it. That is not the case. We have not forgotten Palestine for one moment." Iraqi forces have been moving in on ISIS in Ramadi for 2 weeks. Only 6,00 to 1,000 ISIS fighters remained at the start of the new offensive. Yesterday Iraqi Forces reportedly moved into the town center. The U.S. says there are now only 250 - 350 ISIS fighters remaining. What about civilians? John McCain and Lindsay Graham have an op-ed in the Wall Street Journal calling for the U.S. to put 10,000 ground troops in Raqqa, Syria, to defeat ISIS. And then they want more troops in Iraq, Libya, and anywhere else ISIS is gaining a foothold in the region. Shorter version: The world is our colony, let's start acting like it. Update: Best line of Obama's speech: "Freedom is More Powerful Than Fear." Shorter version: No boots on the ground (with a moving definition of what constitutes boots -- boots now seems limited to hand to hand combat, not troops on ground.) "What we should not do" is allow ourselves to "be drawn into long and costly ground war in Syria and Iraq." We can expect more kill missions (whatever happened to the capture part? It seems gone.) Asks Congress to pass authorization for use of force against ISIS. Just a few references to assault rifles. Asks Congress to pass a bill preventing those on the no-fly list from buying them. We can't stop every mass killer but we can make it harder for them to kill. No. 2: The threat is already inside. No. 3: More surveillance won’t get rid of terrorism. No. 4: Defeating the Islamic State won’t make terrorism go away. No. 5: Terrorism still remains a relatively minor threat, statistically speaking. For the first time since the 1920's, the New York Times is featuring an editorial on the front page of the paper. It calls for gun control. ISIS has released Dabiq #12, the 12th issue of its glossy English magazine. (no links to magazine in comments please.) 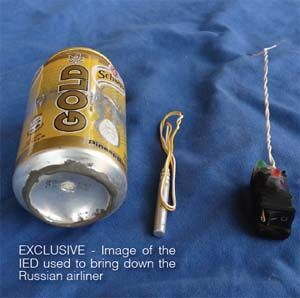 It says a soda can was used to take down the Russian Plane. 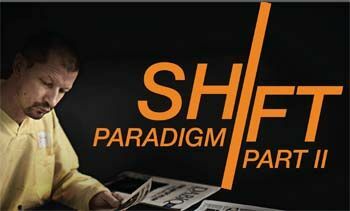 There's an article by John Cantlie, "Shift and Paradigm, Part 2". He refers to events in June and July, so at least he was still alive then, and hopefully is today.